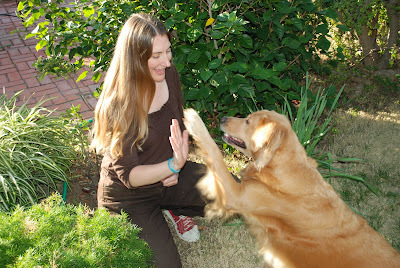 Sindi and Ginger give a happy High 5! Through my work as a psychic reader, energy healer and animal communicator, I have learned that actions are a source of communication that really can speak louder than words. Pets may exhibit behaviors that are labeled as problematic issues, but I see them as attention seeking messages. Because our pets are affected by us and our energy I look at the relationship between the pet and their person when evaluating behavior. Everything is energy, including our thoughts, words and emotions. If we are upset, both humans and animals can sense it. If our upset energy flows from us and into another being’s reality they will experience it and may display similarly disturbed behavior. This is how easily and intensely we can and do affect each other. One beautiful puppy I read had abundant energy that tended to spill out and adversely affect others, most notably her older canine brother. She was being her lively, young and often competitive self and was not aware of how her invasive energy was impacting him. I gave her information to help her contain her energy. She was receptive to the communication. I watched her pull her energy in closer to her body. I then gave a healing to help move her energy out of her brother’s space. Both dogs responded to the healing. I received a phone call from the excited pet parents the next day. They reported that the brother dog was noticeably happier and more energetic. His sister’s energy was meant for her body and energy system and was incompatible and non-beneficial to his. He felt better after regaining his space and experiencing more of his own unique energy. I am always impressed at how simply informing an animal that its behavior is disruptive or harmful is often enough to motivate them to make a change. Like us, animals do the best with what they have. Often all they need is additional information, including desired alternative behaviors, to successfully meet our expectations. Just as animals benefit from additional information, so do we. Using their actions as a form of communication can help us better understand our pets. Potty habits are one way they communicate to us. If a housebroken pet is expelling on the floor, it can indicate the need for medical attention. If we rule out the possibility of illness, we can further examine the behavior and what the pet is trying to tell us. Although I look at each situation independently I have found that when a cat eliminates outside the litter box it is often an expression of anger, frustration or a dislike of some aspect of its life. It could be as simple as the litter box not being cleaned often enough. It can also represent an irritation brought on by poor nutrition or a vitamin deficiency. Anger stimulated when you are on vacation or working long hours is another favorite. It can be a response to any change in the cat’s environment, including moving to a new home, getting a new sibling, added stress or unresolved conflict affecting humans in the household. I had a session with a cat that was continually using the middle of the bathroom floor as its litter box. When I asked her about it she said, “If mommy is going to be bitchy then so am I!” Her guardian was irritated and moving her emotional energy outside of her space and sharing it with others. This gave the cat permission to mirror this behavior, which she did beautifully! Another potty related puzzlement is why dogs eat poop. The most popular answer I receive from canines is because it tastes good! I did a psychic reading for one sweet, intelligent pup whose foster parent wanted to know why he started eating his poop. What I saw made me laugh out loud. He was walking along one day and said to himself, “Hmmm…..what’s this?” After deciding to try some he thought, “Hey - not bad! I kind of like it.” And a poop eating puppy he became! As we share our lives with companion animals, it is important to remember to have compassion for them. We ask that they unlearn their natural instincts and change their behaviors to fit our world. Overall, I would say they are doing a pretty good job of fitting in within our sometimes stringent rules. It can be fun to discover why animals do the things they do. When we acknowledge our pets as teachers, as well as our students, we open ourselves up to helpful learning opportunities. If your pet is stressed or anxious, use it as a reminder to tune into yourself to see if you might benefit from a little relaxation time. If your pet is showing signs of aggression, notice if there is something you are frustrated or angry about that you aren’t allowing yourself to acknowledge or communicate. If your pet is enthusiastic and joyous use it as permission to express your enthusiasm and more fully enjoy your life! I welcome your comments at info@wildtame.com. You may also wish to visit my website at http://www.wildtame.com/.